In schools and other settings, our graduates play a significant role in the lives of pupils and encounter personal, ethical and moral dilemmas which are often unconnected with the taught curriculum. They need to be able to draw on a teaching philosophy that is distinctive and personally informed but reflects ethical values and principles. Such a philosophy needs to be responsive to the demands of a changing world where social, political, economic and environmental issues have a significant impact on the lives of children and young people. As a primary English tutor this is a key part of my role in preparing future professionals. I frequently share books and recommend titles to trainees and colleagues to alert them to interesting and challenging material. This has been a busy year for children’s and YA fiction. A small number of new titles have challenged and offered alternative realities to the hostile climate towards minorities created in the media by politicians and commentators. 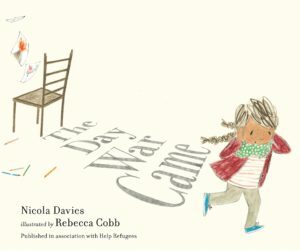 An example is a picture book by Nicola Davies and Rebecca Cobb, The Day War Came. Written to illustrate the situation of refugee children, its pictures are accessible for young children but is uncompromising and has created interesting discussions with trainees. 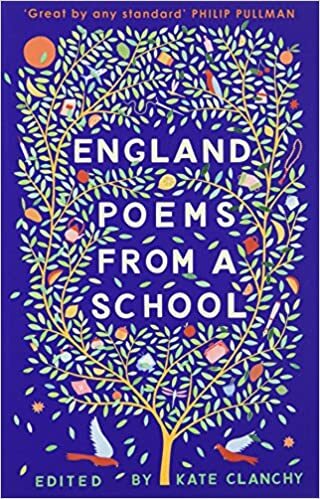 For an older audience, a recent collection of poetry prompted by the work of pupils at Oxford Spires school- England: Poems from a school reflects the authentic voices of refugee and migrant children. Poems from the collection were used to celebrate National Poetry Day on October 4th, 2018 and featured on posters around the DCEC building. It aimed to start a conversation about whose voice is heard when telling their stories. I was shocked but not surprised by the findings of the Reflecting Realities study, published in July 2018, by the team at the Centre for Literacy in Primary Education. 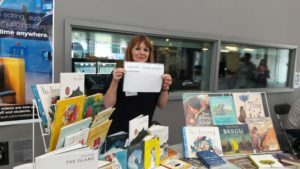 The central finding was that only 4% of children’s books published in 2017 (9,000 + books) featured black and minority ethnic characters and only 1% had a black and minority ethnic person as a main character. The report was widely reported and has profound implications for the publishing industry but also for ourselves as educators and readers. Reflecting Realities was shared with trainees digitally from the beginning of the academic year, and follow up has included discussing how teachers make book selections with different year groups. Finally, we have a new book club for trainees, #AWordinEdgewise . 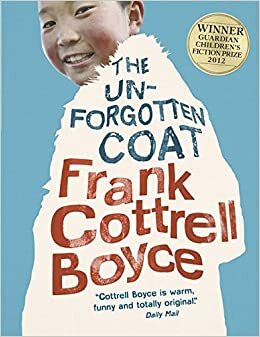 Our first title is the great story by Frank Cottrell Boyce The Unforgotten Coat, featuring the unforgettable story of two young brothers, Chingis and Nergui, as they encounter the reality of moving to a new school in Bootle. I love the books for its warm humour and storytelling and it approaches the topic of welcoming children to the community in a way that is natural and accessible. Far from claiming that these small steps have had an influence on personal philosophies, I hope we have been instrumental in offering a different perspective to trainees. We have tried to share with them the importance of selecting fiction and non-fiction that reflects the realities of life in the 21st century. The reading choices they make are hopefully guided by values and judgements about quality and equality and will hopefully have a positive impact on the materials they choose to share in the classroom. 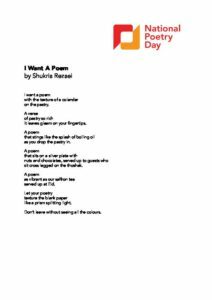 ‘I want a Poem’, one of the poems featured for National Poetry Day: click on the image for a full size version. This entry was posted in education and training, schools and tagged Afghanistan, classroom support, education, fiction, literature, Liverpool, new teachers, Oxford, poetry, reading, school, understanding by Charlotte Hastings. Bookmark the permalink.